Families or groups of up to 8 people who want a luxurious and comfortable stay by the sea. Vista Nacascolo is a luxury three-bedroom residence on a private and gated community. It boasts a great location, perched atop a hill surrounded by forest and overlooking the Arnold Palmer Signature Golf Course and the Pacific Ocean. This is a well-appointed home, perfect to get away from the noise of everyday life and enjoy the best of Costa Rica. Secluded atmosphere. The villa provides privacy and peace. Well-appointed spaces. Art and top-of-the-line amenities feature on every room. Expansive views. Observe Culebra Bay and a world-class golf course from your balconies. Complete isolation. The villa is within easy access to resort amenities. City life. This is a place to commune with nature. Vista Nacascolo is named after one of the most famous beaches in the area, and it’s designed to give comfort and peace. 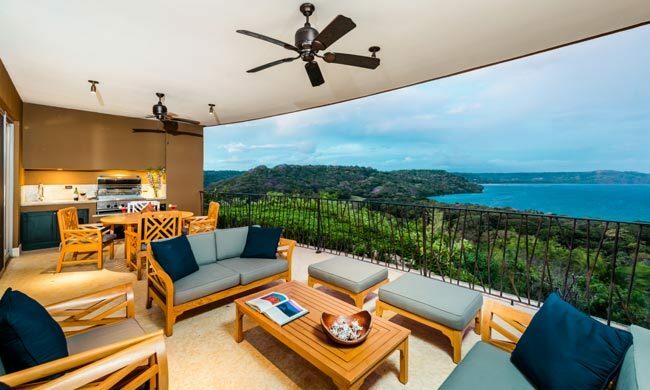 The property has a great location on the Papagayo Peninsula in Guanacaste, providing expansive views of the Pacific Ocean and the surrounding dry forest. It also has easy access to several facilities and services in the area, perfect for those who like to head out and explore the country. This luxurious home provides 2,800 feet of open space designed to combine state-of-the-art furnishings and world-class elegance inspired by Costa Rica’s traditional materials. The home belongs to an artist, and all shared areas and rooms boast examples of his original craft. Rooms and dining spaces are all connected to balconies or terraces, perfect to enjoy the surrounding views of Culebra Bay and the marina. Outside the built-in BBQ and cooking area are ready for an afternoon of eating and fun. Indoors, the fully-equipped kitchen and dining table are ideal for a get-together breakfast. Vista Nacascolo has four fully-furnished decks for you to unwind with a coffee or cocktail. Watch out for all kinds of birds and monkeys enjoying the peace of nature in the nearby treetops. Keep an eye out for butterflies and lizards too. The community has two shared swimming pools for you to enjoy. Lay back for a day of sun and splash in the water to fight Guanacaste’s heat. There are also many facilities and services close by. Resorts open their signature restaurants for lunch and dinner if you are up for something different each day. And for those in search of action, there’s chance to go horseback riding, biking, zip lining, and hiking in the area. If you want to explore the sea, the marina is within easy access. Jump on a private boat to go sportfishing, snorkeling or scuba diving. The Arnold Palmer-designed golf course is of course just down the hill from your rental home, and there is also a tennis court in the vicinity. If luxury, comfort and amazing ocean views are what dreams are made of for you, Vista Nacascolo is the right destination for your Costa Rica vacation. If you have any questions, simply contact us and we’ll gladly help you prepare the getaway of your dreams! 270 degree views of Culebra Bay. Proximity to an Arnold Palmer signature golf course. Three bedrooms, each with an en-suite bathroom. Close to tennis, golfing, adventure tours, nature, and the beach. Marina and restaurants located nearby. Access to shared swimming pools with ocean views. Terrace with built-in BBQ and dining space.